In 1961 the state of Minnesota set aside 14,000 acres in Aitkin County to preserve Savanna Portage, a 6-mile long, centuries old, canoe portage. Savanna Portage State park became Minnesota’s third largest state park. On April 23, 1973, Savanna Portage was placed on the National Register of Historic Places. The park today is 16,259 acres and receives 57,952 annual visits. 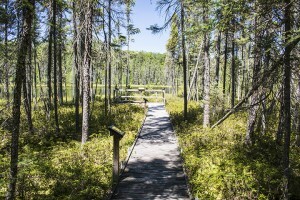 The northeast half of the park is mostly peat bog and mostly inaccessible except by the Savanna Portage Trail. The central portion of the park contains many small lakes, rolling hills, and long ridges. This area contains low areas of swamps, fens, and wet meadows separated and criss-crossed by hardwood- and mixed-forested ridges. The ridges are end moraines left by a retreating lobe in the last glaciation. Most of the park’s 32 miles of hiking trails are in this area. 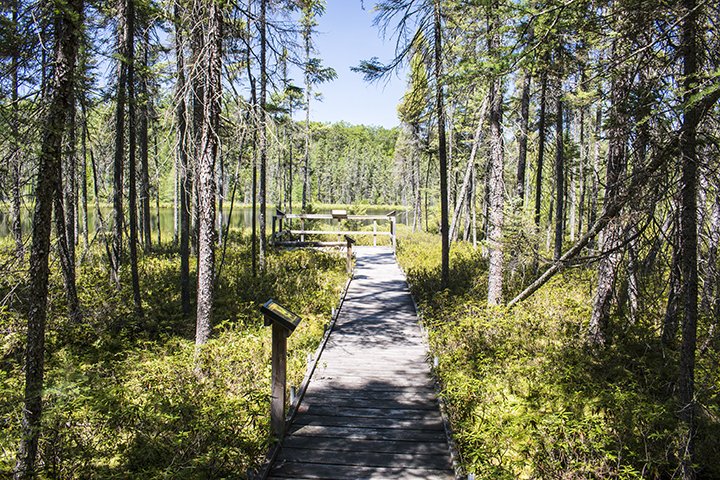 Visitors this week (7/12 to 7/18/2015) will see purple pitcherplant, northern blue flag, and swamp candles blooming next to the bog boardwalk trail; American white waterlily and variegated yellow pond lily blooming on the surface of shallow lakes; elliptic shinleaf, white avens, yellow avens, limber honeysuckle, early figwort, American vetch, and veiny pea blooming in the forest; and black-eyed Susan blooming in forest openings. They will also see scores of northern crescents, many white admirals, and a few Canadian tiger swallowtail, Compton tortoiseshell, summer azure, and other butterflies. This entry was posted in Nature Destinations and tagged Savanna Portage State Park on July 17, 2015 by John Valo. 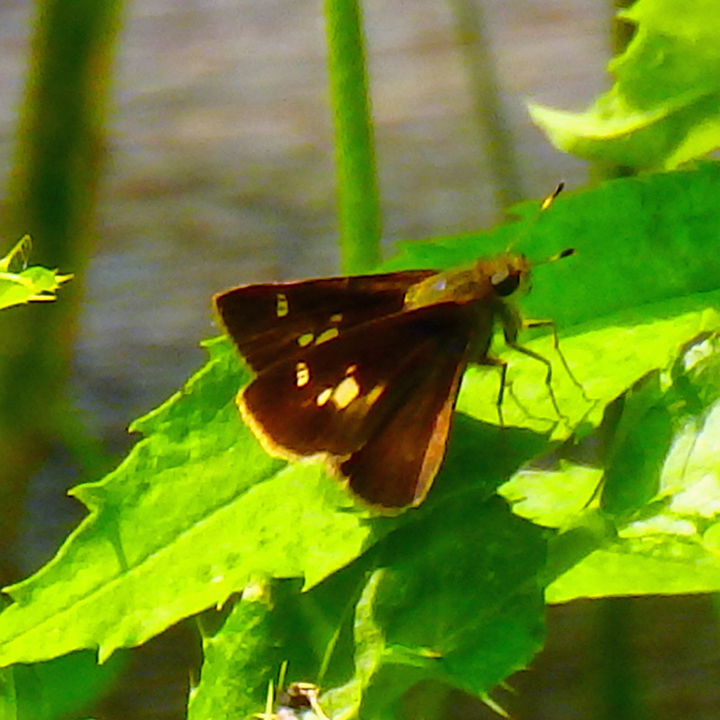 Little glassywing (Pompeius verna) is a medium-sized grass skipper with a wingspan of 11 ⁄16″ to 1½″. It is common in much of the eastern half of the United States but uncommon in the Upper Midwest, including Minnesota. The caterpillar of this species feeds exclusively on the leaves of purpletop tridens. It creates a shelter by rolling up one leaf of the grass or tying adjacent leaves together with silk. It remains in the shelter during the daytime, coming out only at night to feed, overwinters in it, and pupates in it the following spring. Little glassywing is similar in appearance to Dun skipper (Euphyes vestris) and northern broken-dash (Wallengrenia egeremet). These three species are called “the three witches” because their dark wings make it difficult to tell “which one is which.” Little glassywing is distinguished by the large, rectangular or square, semi-transparent (“glassy”) spot on the forewing; a row of very pale spots on the underside of the hindwing; and a white band just below the swollen tip of the antenna. This entry was posted in Insects and tagged little glassywing, Pompeius verna on July 5, 2015 by John Valo. This Wilkin County site became a preserve in 1973 when The Nature Conservancy (TNC) purchased 160 acres from Anna Gronseth. The intent of the purchase was to protect a booming ground of the greater prairie chicken, a species of special concern in Minnesota. TNC expanded the preserve at least seven times with additional land purchases over the next 26 years. 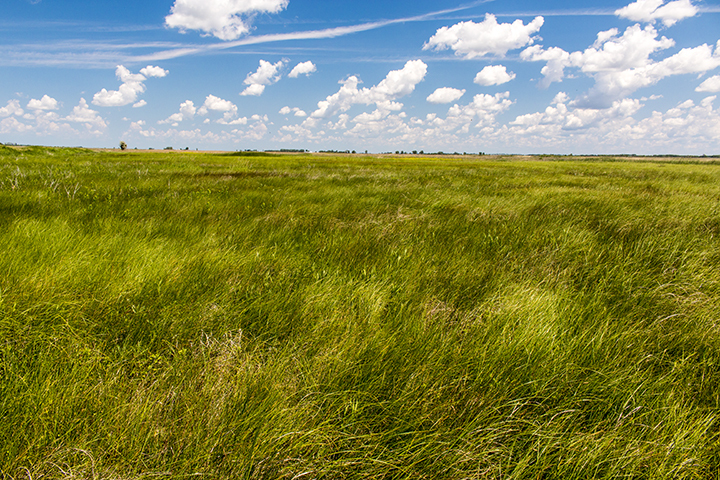 Anna Gronseth Prairie is now 1,299 acres of mostly wet prairie with a few pockets of calcareous fen. Visitors this week (6/28 to 7/4/2015) will find Canada anemone, mountain death camas, and prairie turnip at their peak, and golden ragwort, pale agoseris, and silverweed also blooming. If you are planning a visit, waterproof footwear is recommended. This entry was posted in Nature Destinations and tagged Anna Gronseth Prairie, The Nature Conservancy, TNC on July 1, 2015 by John Valo.